Tom Taylor's life long ambition was to design and build his own boat, and this 20-9" cuddy cabin runabout finally fulfilled that dream. 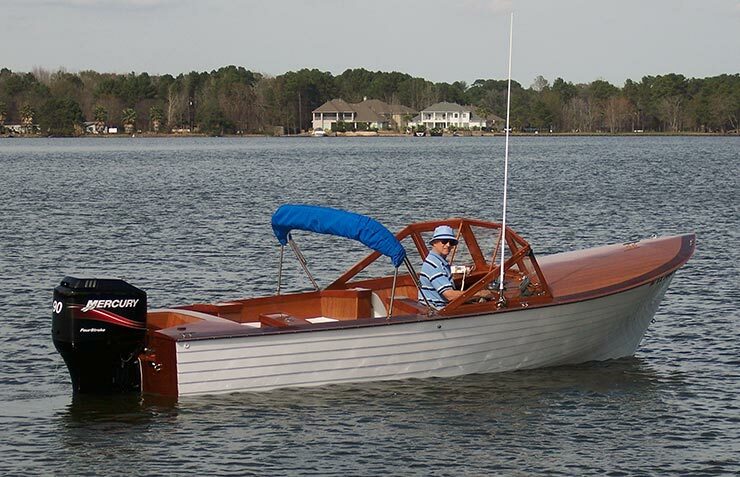 Powered by a Mercury 90 hp four-stroke engine, it has a mahogany hull with lapstrake construction. He wanted a smooth riding, dry bay boat, with low fuel consumption. This boat is very narrow with a deep forefoot to give a smooth ride in a chop. He uses on the Texas Gulf Coast, achieving a top speed of 48 mph. Tom writes that it won first place as the People's Choice award at the Wheels & Keels Concours d'Elegance at the Lakewood Yacht Club in Seabrook, Texas. Tom can be contacted at BTaylor617@aol.com.